She was refined, well-educated, extremely religious, and an adamant opponent of slavery, but the life of First Lady Jane Pierce is generally remembered as a collection of tragedies. She was very shy, subject to frequent bouts of depression, and she had few friends beyond her aunt Abigail Kent Means and her sister Mary Appleton Aiken. Her family opposed her marriage to young lawyer and future President Franklin Pierce. She always hated the trappings of his political life, and she especially hated Washington DC. After the death of their infant son Franklin Pierce Jr in 1842, she pressured her husband to give up politics, and he did, leaving the Senate and turning down a subsequent offer to become Secretary of State under President James K Polk. Typhus claimed their second son, Frank Pierce, a few years later at the age of four. Mrs Pierce reportedly fainted when she heard the news that her husband had been nominated for President, to his surprise, on the thirty-fifth ballot at the Democratic Party's convention in 1852. She quietly hoped he would lose the election, but he won, and before his inauguration the Pierces were aboard a train that derailed and toppled over an embankment, merely bruising and scratching them but killing their third and last son, 11-year-old Benny Pierce. Overcome with grief, Mrs Pierce did not attend her husband's swearing-in as President, and asked her Aunt Abigail to handle the First Lady's social responsibilities. Weeks after her husband became President, the previous First Lady Abigail Fillmore passed away, and Vice President William R. King then died of tuberculosis, adding to Pierce administration's aura of gloom. Mrs Pierce spent many of her private hours writing long, heartbroken letters to her third dead son, and it was nearly two years before she took on her social obligations as the hostess of the White House. Even then, she usually wore black and a somber expression at official soirees. Author Nathaniel Hawthorne once visited the capitol, and later referred to the First Lady as "that death's head in the White House". Almost immediately after James Buchanan was elected President 1856, the Pierces left the White House, living the last few months of their administration as guests of Secretary of State William L. Marcy. 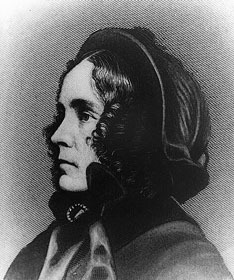 When Buchanan took office, Franklin Pierce took his wife on an extended cruise to the Caribbean and Europe, hoping to revive her spirits, but on vacation she contracted tuberculosis. Her worsening disease, the beginning of the Civil War, and her husband's growing alcoholism soured their remaining years together.